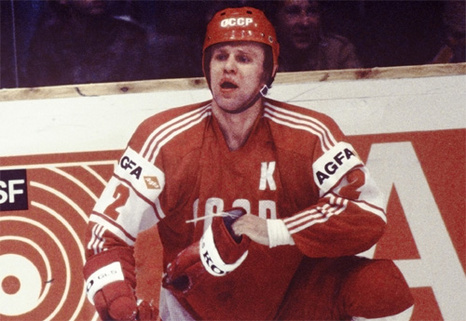 Leadership, as well as skill, were on full display from legendary VYACHESLAV FETISOV for all the world to see at the 1988 Winter Games in Calgary with the long-anticipated Olympic rematch between the Soviet Union and the United States. The Soviets stormed to a 6-2 lead after two periods, which prompted the powers-that-be in charge at ABC Sports to switch their prime-time coverage to other events. Television executives were soon left red-faced, however, when the USSR somehow allowed the USA to claw their way back into the contest. A goal from the University of Minnesota’s TODD OKERLUND (11) brought the scrappy Americans to within sight of a tie with just under eleven minutes to go in the game. Following a SERGEI MAKAROV (24) rush, Fetisov (2) senses the opporutnity and joins the play at the blue line to receive a pass from VLADIMIR KRUTOV (9). With a head of steam, the Soviet skipper stickhandles past two American defenders with seemingly effortless ease. On the backhand, Fetisov casually splits the pads of United States goaltender CHRIS TERRERI with precision to put the result beyond doubt for the USSR.